It is time to go back to the start of where it all began. Following the discerning gents’ visits to both HKK London and Yauatcha, it is now time to check out what started the capital’s love affair with decadent Chinese cuisine since 2001. 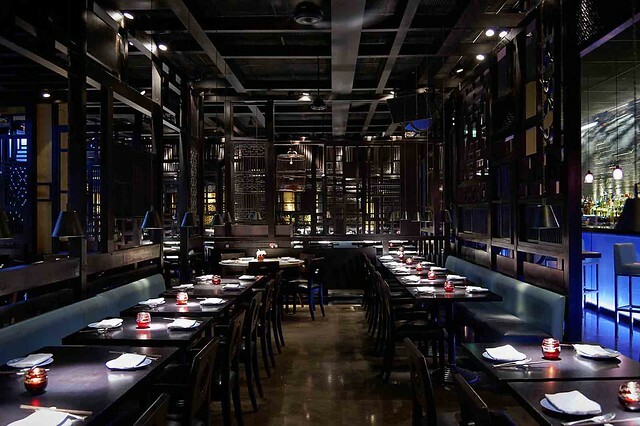 Hakkasan Hanway Place is the venue and exquisite Chinese food made to look like works of art are its forte. Tucked away behind Tottenham Court Road, London, the view from the outside is subdued. Descend the stairway and be welcomed into a subterranean foodie haven. As way of background, Hakkasan Hanway Place is headed up under the eye of Head Chef Tong Chee Hwee who has been part of the team from the very start. The restaurant was awarded a Michelin star in 2003 which it currently retains. 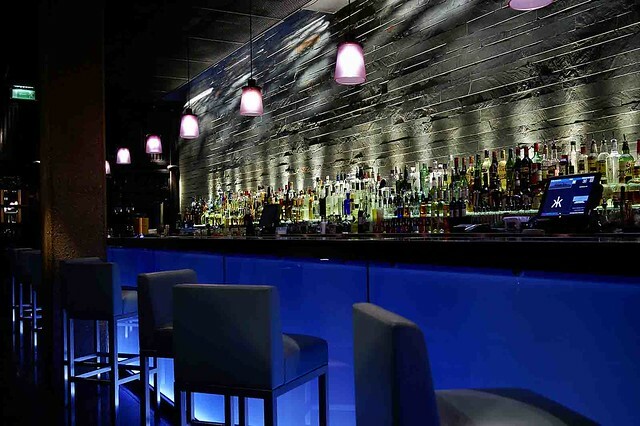 This summer saw the Hakkasan group expand with a new venue, Ling Ling, in Mykonos, Greece. As part of the launch festivities, a new *limited edition menu has been created to showcase the Mykonos style and flavour. Inspired by the izakaya concept, a traditional Japanese drinking establishment serving food in a casual setting, the Ling Ling menu is crafted to encourage diners to experience Hakkasan’s food differently. Priced at £35 per person it includes a cocktail on arrival and four courses. Think smaller plates with a variety of Cantonese-style dishes with great summer cocktails and drinks – all to the vibrant beat of an eclectic soundtrack. Time for the discerning gent to get his chop sticks snapping to the sound of the rhythm of the beat. Entering this subterranean wonder land, the slick styling of the decor immediately jumps out. Designed by the famed Christian Liaigre, the wooden lattice screens divide up this foodie playground into distinct areas – the 16-foot cocktail bar, various dining areas with plentiful seating for small-to-large groups. It’s dark, it’s intimate, it’s Hakkasan. The menu kicks in once you’re settled – a relatively straightforward choice is needed : go for fish and seafood; meat and seafood; or vegetarian. Once selected, a signature cocktail is soon at your table as way of welcoming you further – the Ling Ling Collins. A refreshing tipple to start the evening’s proceedings with. 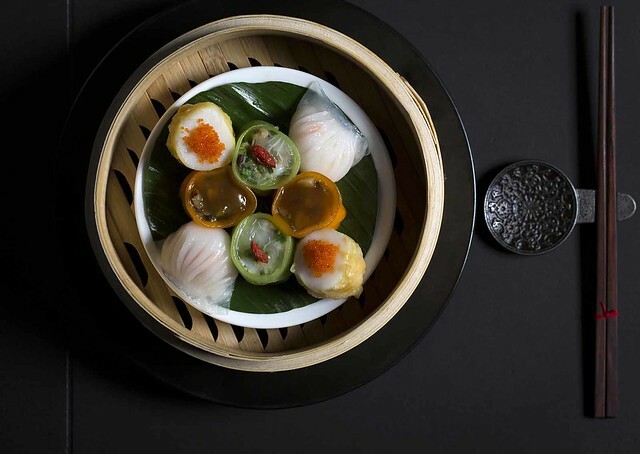 Soon afterwards, the first course arrives – the trio dim sum platter featuring scallop shumai, har gau (shrimp)and Chinese chive dumpling. These tasty morsels are a great way to eat whilst catching up with a friend or talk business with a colleague. All three are delicious but the scallop shumai needs to be called out for particular praise. Enjoyed with your cocktail, or further still with wine. Hakkasan has an extensive, and award-winning, wine list to choose from and the sommelier’s here are very knowledgeable and can recommend based on your palate – just let them know what works for you and they’ll do the rest. Service needs a mention too – attentive yet discrete. They’ll know when to be present or not, leaving you deep in conversation…or mouthfuls of food. 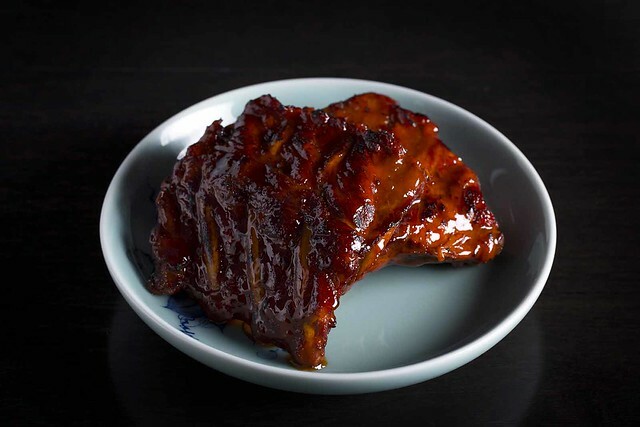 The second course soon presents itself, jasmine tea smoked pork ribs come to the table sizzling away. Added theatre comes from your waiter who then separates each rib for you to enjoy shortly. These ribs are cooked so tenderly only a fraction of bite is needed to pull the delicious flesh away from the bone and start melting in the mouth. Sublime. 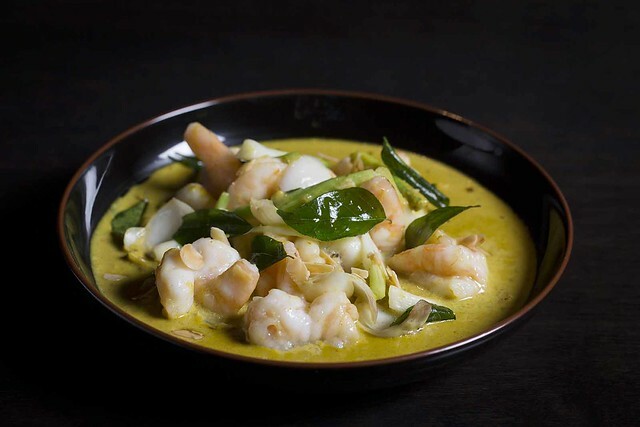 A few more sips of wine or a cocktail and it’s time for the main course – spicy prawn with lily blub and almond curry with steamed jasmine rice. The prawn does have a kick to it but it’s easily quelled with a sip of wine. The curry works well with the jasmine rice – not too heavy and full of flavour. Whether immersed in discussion or savouring the taste to the beat of the background music, this is an enjoyable way to dine. To finish the meal a selection of macaron are served for desert to satisfy the sweet tooth desires of diners – served up as if they were steamed like dim sum, as way of carrying on the theme. Each pastel-coloured gem had just that right amount of melt-in-the-mouth chewy consistency that makes a macaron so good. Hakkasan isn’t a secret in the foodie world purely by the longevity of its now international reputation. It’s this reputation which has made it a standard-bearer for modern Chinese/Cantonese cuisine though. The Ling Ling menu is an interesting take on existing dishes – much of the menu is available on the a-la carte list – but it’s the selection of this particular combination, along with the setting, which takes the menu worry away from diners. 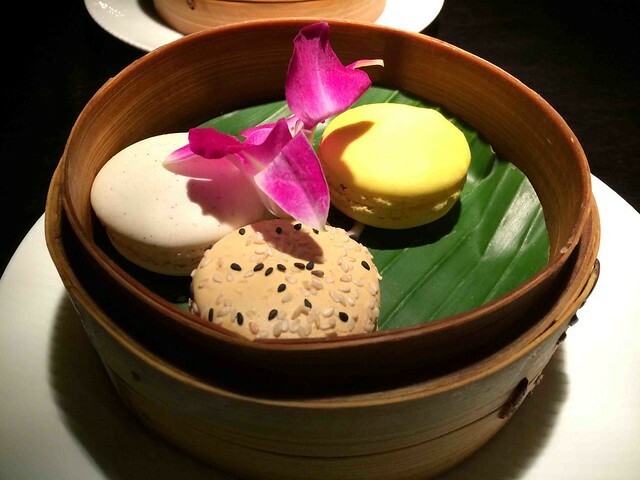 Whilst the Ling Ling menu may be temporary, the quality of Hakkasan’s food as always remained permanently high. It is this that will keep the discerning gent returning time after time. *Special menu note: the limited edition Ling Ling menu is available at certain times through the week, please contact the restaurant for more details. Ling Ling menu available until 31st August 2015.